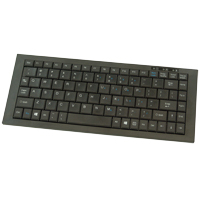 The scissor-switch compact keyboard offers full size keys in an efficient layout. The low key travel scissors keycap architecture is an improvement over traditional membrane keyboards and ensures that typing is quiet, stable and comfortable. All the letter keys are full size with a 19.05 mm / .75" key pitch (the space between the centre of neighbouring keycaps) - only some of the bottom row, all of the top row and the right column are slightly narrower. Click here for the Full Travel Mini Keyboard. 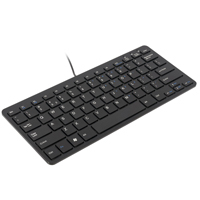 The SK595 Mini Keyboard is our most inexpensive small footprint basic keyboard. It has a low key travel (3 mm instead of the standard 4 mm) membrane keyswitch. Important Note: All the keys apart from the letters and numbers are smaller than on a 'conventional' keyboard. 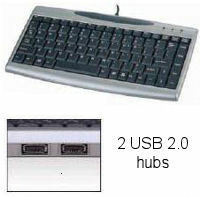 Click here for the Number Slide Compact Keyboard. 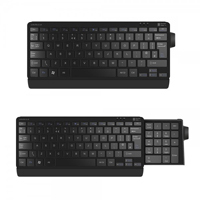 Click here for the R-Go Compact Keyboard.